Congenital insensitivity to pain with anhidrosis: What is Congenital Insensitivity To Pain With Anhidrosis? What is Congenital Insensitivity To Pain With Anhidrosis? Congenital insensitivity to pain with anhidrosis (CIPA) is a rare disease of the nervous system that doesn't let people feel pain. It happens when they born with a mutation in a gene known as SCN9A. This mutation don't let the Nociceptors* (The cells that made you feel pain) be well developed. They can't feel Pain and in some cases they also can't feel heat and cold. They can feel other sensations like the touch because when the cells send the electrical charges (or information) to the backbone one of the sent proteins is encoded by the mutation in the gene SCN9A so the brain recieves other information and they will never going to feel pain but the information is enough to tell the person that someone or something is touching him. *Nociceptor: (wikipedia October 26 of 2011) "a nociceptor is a sensory receptor that responds to potentially damaging stimuli by sending nerve signals to the spinal cord and brain. 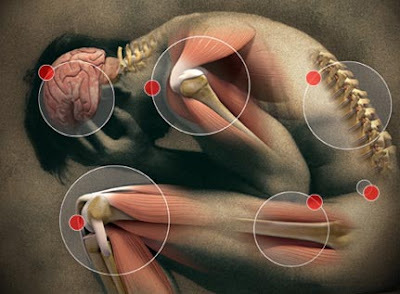 This process, called nociception, usually causes the perception of pain." Nociceptors are located in the skin tissues at the end of the axons. They can't sweat so thats why they can't balance their temperature, so, in summer they have Hyperthermia a medical condition that is produced when the body have more heat that it can handle, mental retardicion and infeccions in the mouth, laceration and scars, Bones fractures and deformities which can end in amputation other problems can be infections by scratching them during sleep. 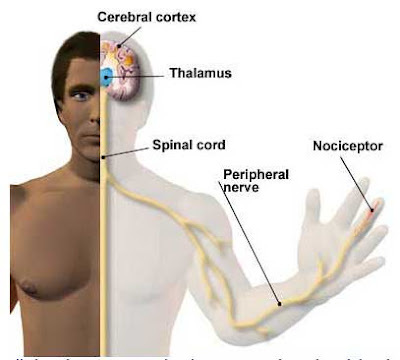 How is CIPA related with the nervous system? The CIPA is related with the nervous system becouse the mutation in the gene SCN9A encode the protein that is essential in the process of feeling pain. That affect the magnity of the feeling doin it more soft, so they know that they are touched by something but they never feel pain. According to The Medical library: "Treatments for CIPA do not always work; however, there are some cases where naloxone may be used as a treatment. Naloxone is a chemical that acts within the nervous system of the body by blocking the nervous system from causing the inactions that occur within the group of cells that receives the message to initiate the sensation of pain, heat, or cold. Most treatments are hard to narrow down for this condition because each CIPA patient may have other conditions including the absence of sweat glands, nerve fibers, ulcers, and other conditions."